Since today begins the Chinese Year of the Pig, I present an archival post on Black Swine at Gyb Farm. As a musician I pride myself on having acute hearing. This is a mixed blessing: an infant’s shrieks hit me right between the eyes, while the sub-woofered cars that drive by at bedtime make me want to run amok with a cross-bow. Possibly it is this sensitivity that makes stories of haunting in which sound plays a prominent part so fascinating. While the sights seen by this family were horrifying in the extreme, I think the sounds would have driven me mad. ‘Some forty years ago my father resided at a small farm-house, the back part of which faced a large unenclosed common (since inclosed), and stood close to four cross-roads, two of which lead to what thereabouts is called “Uphills,” the Chiltern Ridge from Tring to Wycombe and Stokenchurch. The spot is very lonely even now, but was much more so then; for, at that time, there was not a single human habitation within a quarter of a mile of my father’s abode. Our house had always been called “The Gyb Farm,”—why, we did not exactly know—but because, as we afterwards found out, there had been often erected, near the site of it, a gibbet for the punishment of malefactors, and many a person who had taken his own life (let alone the murderers, highwaymen, and sheep-stealers), had been buried at the side of the road there; but the name of the farm, as a law-parchment states, seems to have been altered about the year 1788, when a much less disagreeable name was then adopted for it. ‘In the year, and about the time, that King William the IV. died (i.e. in 1837), my father and mother, two of my sisters, a younger brother and myself were all at home. One night, when we had all been in bed for some time, quite in the smaller hours, we were each suddenly startled and awakened by the most frightful shrill and horrid shrieks and noises just outside on the roadway that ever man heard. Partly human and partly as if made by infuriated hogs, violently quarrelling, the roar and the screeching simply appalled us. I never heard the like of it in my life. It went through and through me. ‘For a little while we all endured it: but in about five minutes we gathered half-dressed at the top of the staircase—father, mother, my brother and I—and went to a long front window overlooking the road, in order to learn the cause. The night was rather dark, and as our tinder-box would not light, we were looking out, without any candle or lamp, towards the spot from which this horrible and hellish row came, when all of a sudden a white face—a face most awful in its pallid aspect and miserable imploring look—was pressed from outside against the glass of the window and stared at us wildly. We all saw it, and I could mark that even my father was deeply affrighted. The indescribable and unearthly noises still continued, and even increased in their discordance and frightful yelling for at least four or five minutes. Then by that time a candle had been procured. ‘My father at once opened the lattice: and there by the light of the sky, such as it was, we saw a collection of most hideous black animals, some of them like large swine, others horrid and indescribable in their appearance, grubbing up the ground and half buried in it, scattering the earth upwards where the graves were, fighting, screaming and roaring in a way that no mere words can properly tell or set forth. Some of them, judging by their motion, seemed to have no bones in them. ‘We were all very much terrified. My mother implored the. Almighty to protect us, and I confess that, overwhelmed with fear, I prayed most heartily to God for His assistance. In a minute or two after this, with shrieks increased in intensity, the frightful creatures (whatever they were) rushed screaming down one of the roads. [Author’s note: I append the following attestation: ‘The account which was given to Dr. Lee of the “Gyb Ghosts,” when it was written out fairly, was read over to me. I made several additions to it (to make it all the clearer to people who know nothing about it), and these additions were inserted in Dr. Lee’s copy. The story is true, and may be put into a book. ‘The ghost account is true, as now read to me. I had it from my uncle. 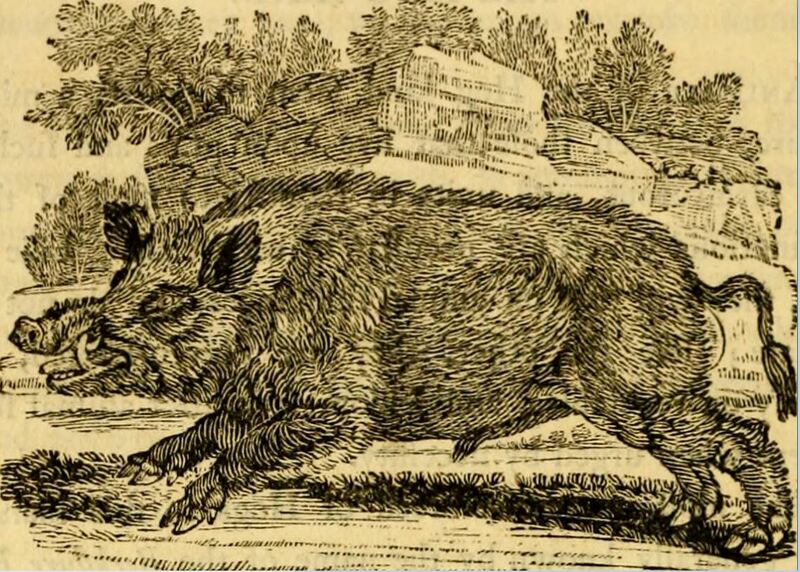 While swine figure heavily in Celtic mythology, they are relatively rare and bear a bad name in ghost-lore, perhaps due to the Biblical Gadarene incident. One could see M.R. James penning something horrifying about gibbets and porcine shrieks (with a hint of an imploring face at the window) after reading this story. For more shrieking hog ghosts, see The Phantom Hog Train.